"The injuries were so severe they thought he was dead." 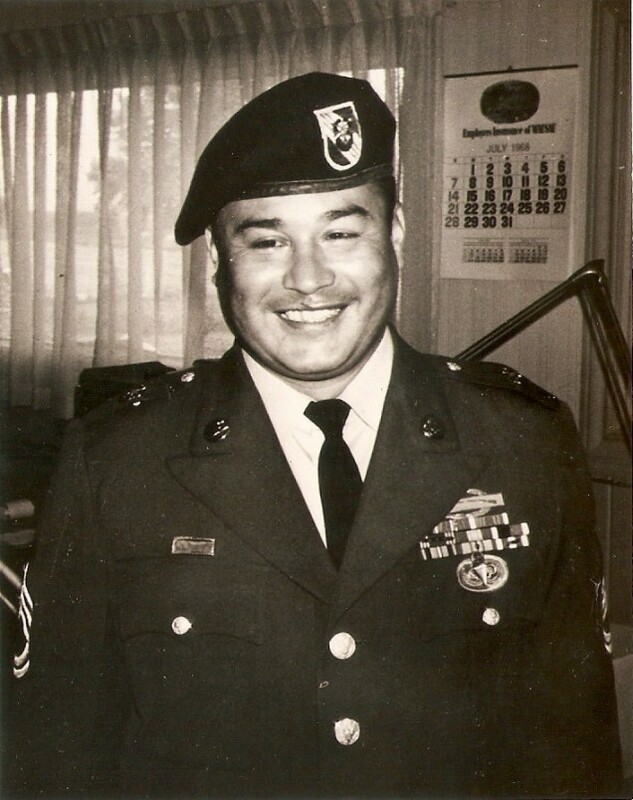 In 1981 Army Master Sergeant Roy P. Benavidez, a Green Beret, received the Medal of Honor for his service during the Vietnam War. On his first tour there, he was severely injured by a land mine and told that he’d never walk again. After a year of rehabilitation, he walked out of the hospital and eventually returned to Vietnam for a second tour. That’s when he spearheaded a daring rescue, saving the lives of eight fellow soldiers. In the process his jaw was broken and he was shot 37 times. At StoryCorps, his daughter Yvette Benavidez Garcia and her husband, Rene, remember the aftermath of the battle. Roy P. Benavidez died in 1998. Click here to watch President Ronald Reagan present Roy P. Benavidez with the Medal of Honor in 1981. Originally aired July 3, 2015, on NPR’s Morning Edition. Photo courtesy of the Benavidez family. YBG: The injuries were so severe that they thought he was dead. So they put him in the pile of the dead and he was trying to muster up enough strength to get this medic to notice he was alive. And all he could do was spit in the medic’s face. That’s when the medic realized, This man’s alive. And, as a child, I remember sitting in the backseat behind him. All of a sudden, I could see blood dripping from the back of his head. And I would say, “Hey dad, you know your head is bleeding.” And he would reach back there and literally pull out a piece of shrapnel that was making it’s way through his skin. And he would just throw it away–you could hear the click. What did you think about my dad? RG: My first impressions of him were at age 16. He just looked angry. YBG: Because you were dating his daughter. RG: Probably, yeah. I remember the way he walked, I mean, it looked like a person in pain. YBG: Do you remember when you’d come over and watch a movie and him sneaking up on us? YBG: Yeah, I’d go over there and he couldn’t move fast enough to get away so he would act like he had just gotten there.